It is common knowledge that any servers exposed to the internet needs to be placed in a DMZ. However, a web application sometimes need to get user input and updates to backend database tables etc. How and where would you place the database server. 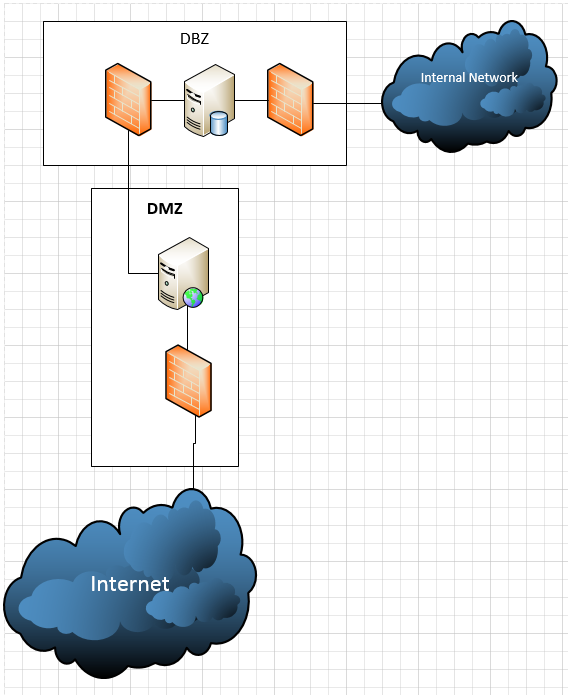 In the DMZ, or allow database connections through the DMZ firewall back to the internal network where the database server is housed.? For a reasonable level of security, the answer is really neither. The database should be housed in it's own zone, not the DMZ with the web server, or in the internal network zone. This allows additional levels of protection both against intrusion from the public Internet should the web server or web application be compromised, and against attacks from the internal network which are a very real problem. It also offers a defense in depth mechanism to protect the internal network should an attacker who penetrates the DMZ figure out how to piviot into the DB zone...While they own the DB at this point, you don't want to them to own the internal network as well. Ideally the application would be written to conform to a 3 tier architecture. In this scenario it is common for the Presentation Layer to reside in a WebDMZ, the Application Layer to reside in an AppDMZ and the Data Layer to reside on the internal network. If this isn't feasible for some reason or another, I recommend the database reside in a DatabaseDMZ. The users on the internal network can still be granted access from the internal network to the server in the DatabaseDMZ. Do NOT allow the Database server to initiate communication to the internal network, only the other way around. You want to avoid a situation where a server in a WebDMZ has direct access to the internal network. Not the answer you're looking for? Browse other questions tagged web-application webserver databases dmz or ask your own question. Worthwhile from security standpoint to limit database server user for ASP.NET website to only EXECUTE on stored procedures? Securing the backend of your web application?